In recent years, backpack sales have totaled over $1.2 billion dollars, and with such a large selection to choose from, it can be difficult to know what product to purchase. 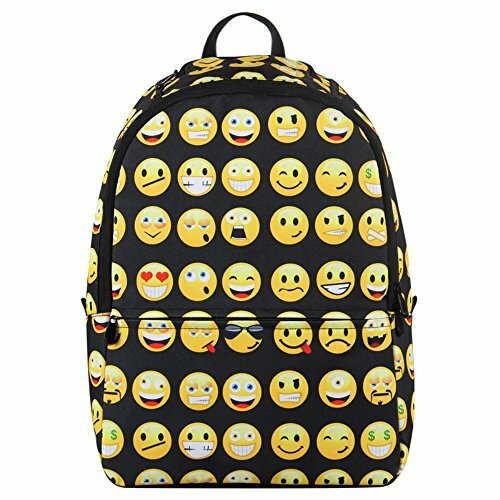 Over 50 percent of all backpacks are purchased for kids who’re 17 or younger, and you’ll find a huge selection of emoji backpacks to choose from. Most parents already know that social media is extremely popular, and these days, most kids are always texting or communicating over the Internet. An emoji is defined as a digital image, and it’s used by people to express emotions or ideas. A great example of a popular emoji is the smiley face that you might receive at the end of a text message from your child. The emoji craze started in Japan, and with the help of the Internet, it has crossed thousands of miles of ocean and found its way into American stores. You can find many different emoji products for sale as our last post on emoji pillows suggests, and backpacks are especially popular products for young children. However, you don’t have to be a kid to enjoy the benefits of owning an emoji backpack. Below, you’ll find reviews for 10 popular emoji backpacks, and by selecting a product from the list, you can avoid wasting your time and money. The Emojination Girls’ Rainbow backpack is suitable for a young girl, and it’s made from 5 percent PVC and 93 percent polyester. The remaining two percent of material consists of other fibers. This backpack is imported and must be hand washed, and it has several useful features to offer. The main features on the exterior are the locker handle, front zip pocket, padded straps and adjustable straps. Since this product comes with a detachable lunch bag, it’s ideal for young girls and can be used for school. The bag’s exterior is covered in classic emoticons, and the bright, vibrant colors make the designs stand out. This backpack is made with plenty of space, which is great for schoolwork, and the graphics look much better than some of the other products on the market. This bag might serve as a great gift for a young girl, and it’s one of the best choices for holding school supplies. The Leaper Causal Style emoji backpack is another top product, and the outer material consists of premium polyester. For enhanced water resistance, the outer material has been coated with water repellent, but the bag isn’t completely waterproof. This bag is great for rainy days, and the inner material consists of polyester lining. It has strong, smooth zippers for increased performance, and it’s a great choice for students who need to carry a laptop. The entire bag is colored in bright yellow emoji icons and features three classic smiley faces. The main compartment is designed to be very spacious, and it can hold a variety of school supplies. With this backpack, students can carry important magazines, notebooks, A4 files and textbooks. The Leaper Causal Style backpack even has two side pockets, and they can hold a water bottle or umbrella. With an ergonomic, padded back, this bag is comfortable to wear, and to prevent overheating, it encourages airflow through the back. The shoulder straps can be adjusted, and the cute emoji pattern will catch the eyes of passing students. The Hynes Eagle Printed Emoji backpack is like the Leaper Casual bag, but it’s different because it’s smaller and made mostly for kids. Like the other products on this list, this bag features a cute emoji pattern, and it’s made from 100 percent polyester. 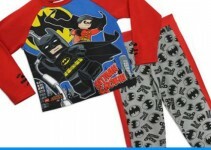 The inside of the bag is lined with polyester, and it’s recommended for kids between six and 12. This product features a web ego handle, and the contoured shoulder straps can be adjusted for comfort. Since it’s made with a padded back, this backpack encourages proper airflow, and it’s suitable for summer weather. The Hynes Eagle Printed emoji backpack is made with two Velcro side pockets, one top zip pocket, one front zip pocket and one main compartment. It also has an elastic sleeve for organization and can hold a 14-inch laptop. This product could be a great choice for younger kids, and the classic emoji pattern has been designed with vivid, high-quality graphics. Although it’s a popular choice for school, it can also be used for traveling or casual situations. Like other products from Hynes Eagle, this bag is recognizable by its simplicity and mobility. Here we have a popular schoolbag for girls or boys, and it features 600D polyester material. For a comfortable fit, the shoulder straps can be adjusted, and the bag comes with two pockets. The medium internal pocket can be used for holding important school supplies, and the external zipper pocket is useful for holding a water bottle or umbrella. The OURBAG Cute backpack features a vibrant emoji pattern, and the emoticons are bright enough to be seen from a distance. With internal polyester lining, this backpack is durable enough to hold textbooks and school supplies, and to keep everything secure, it has a zipper closure. This emoji schoolbag features a basic white color, but the emoji graphics are bright purple, yellow, blue and red. Most classic emoticons can be found on this bag. The Cherioll® Casual Funny Emoji backpack is a top choice for kids, and with adjustable straps, it’s easy to adjust for comfort. The exterior of the bag is made from high-grade canvas fabric, and the interior consists of durable polyester lining. 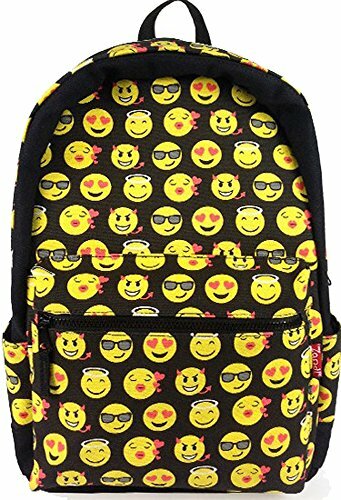 With an iconic emoji pattern, this backpack should be a hit with most kids, and the vivid emoticons are bright enough to catch the eyes of other students. Unlike some of the smaller options, this bag has a huge capacity, and it’s a top choice for traveling, short vacations away from home, casual use and school. For optimal carrying comfort, the curved shoulder straps are thick and ergonomic. With additional padded back support, this backpack can be worn for long periods of time, and it’s designed with a wide range of useful features. To accommodate beverages and essentials, it has two Velcro side pockets, and the front zip pocket is great for stationary and storage. There is even a laptop sleeve within the main compartment, which can hold a 14-inch laptop. The Mani Gym drawstring backpack is like a hybrid bag, and despite its small size, it’s large enough to carry the essentials. This bag is imported and made from polyester material. It features witty emoji graphics, and it’s comfortable enough to be worn for hours. With a lightweight design and soft shoulder straps, this bag is much more comfortable than some competing products, and despite its small size, it can hold clothes, pens, phones and notebooks. The strong polyester material can withstand daily use, and the spacious design makes it a great gym bag for school or play. Most people will find this bag useful for daily activities, and it’s capable of holding over 10 pounds of weight. The smaller design is great for people who want to carry the essentials and maintain a neat appearance. The drawstring closure keeps your belongings safe and allows you to access them quickly. 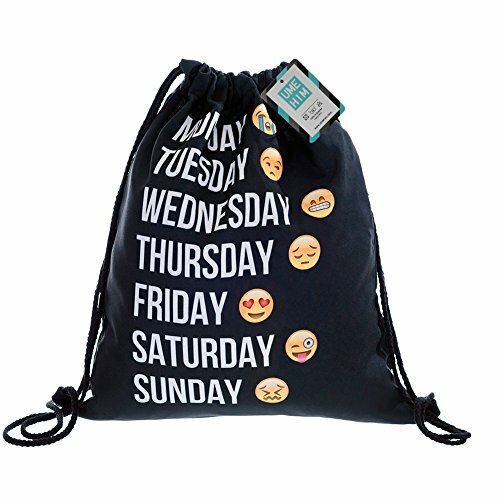 Here we have another popular emoji backpack, and the quality of the materials are guaranteed by the manufacturer, which is why it comes with a great warranty. This bag features zippered pockets, and the side mesh picket is great for storing important school supplies. Since the shoulder straps can be adjusted, this bag is comfortable enough to wear for several hours, and it’s a suitable product for kids of all ages. The bag’s exterior is covered with vibrant emoji graphics, which look just like the icons that you can find while using most smartphones. This backpack could be a decent choice for a daughter, and it can be used for school, play or casual activities. 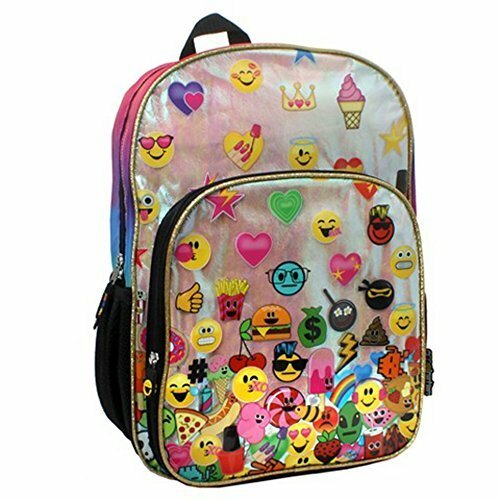 The Emoji Emojination Rainbow backpack has two zipper closure compartments, and they can be used to hold important school supplies. There are two mesh pockets on the side, and a carry handle makes this bag extremely mobile. The adjustable shoulder straps are padded for extra comfort, and they make it easier to wear this backpack for long periods of time. 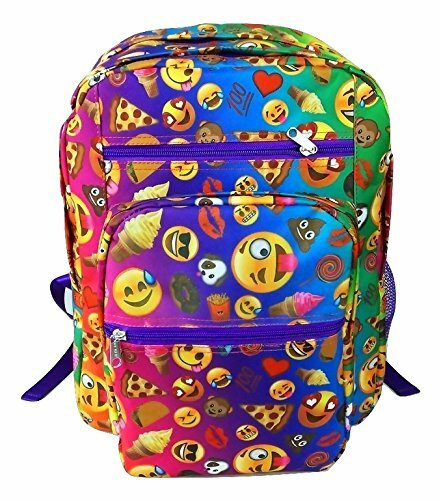 The exterior of this bag features many well-known emoticons, and with bright, vibrant colors, other kids will notice the design. This bag could make a great gift, and since it’s suitable for a variety of activities, it’s a top choice for kids. The Senmar Cute emoji backpack features 600D waterproof polyester, and for maximum durability, the interior is lined with nylon. With strong shoulder straps, this bag can hold a large amount of weight, and the breathable mesh fabric encourages proper airflow. The Senmar Cute emoji backpack is a top choice for kids because it can hold a 14-inch laptop. The variety of features that it comes with make it suitable for traveling, casual use or school, and the exterior emoji design is very catchy. For additional storage space, it has a front zipper pocket, and the main storage compartment is big enough to hold most essentials and school supplies. 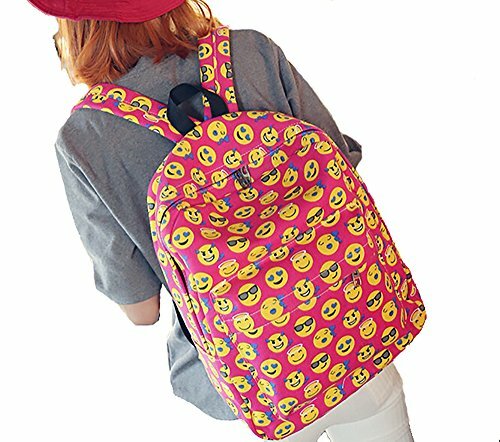 The Aligle Cute Emoji backpack is a popular product for young children, and the exterior features a bright, yellow emoji graphic, which consists of a smiling happy face. Since it’s much smaller than the other products, this bag isn’t the best choice for older students, but for better compatibility, its height can be altered with adjustable shoulder straps. This tiny emoji backpack is useful for many occasions, and the cotton plush material feels as soft as it looks. If you’re considering this product, make sure to check the dimensions because it’s significantly smaller than a standard backpack.